With only days before Nigeria’s February 16 presidential election, it appears a two-horse race between two septuagenarians in a country of nearly 200 million of which more than 75 percent are less than 35 years old. In a line up with more than 70 other candidates, President Muhammadu Buhari, 76, and 72-year-old former Vice President Atiku Abubakar, are dominant in the media, leveraging the power of money in Nigerian politics and their party’s large patronage networks. Notwithstanding their advanced age, both men claim they have the energy and mental health to effectively do the top job. Both men, who are Muslims from the north of the country, have been recurring actors on Nigeria’s political scene since the 1980s, with Buhari first emerging as a dictator through a military coup in 1983. His short-lived military junta left a bitter memory in the minds of Nigerians old enough to know through the sheer brutality of their policies and asphyxiation of many businesses. After his overthrow, Mr. Buhari entered politics and contested for the presidency three times before his eventual victory in 2015 under the banner of the All Progressive Congress (APC), with a three-point agenda: To root out corruption, fix the economy and tackle insecurity. However, his government was immediately characterized by inertia with a slow response to critical challenges that drove the economy into recession. A substantial part of his time in office was spent abroad battling poor health resulting in a seeming drift and a lack of direction in national affairs. His government has also been severally accused of being selective in the fight against corruption, of perpetrating human rights abuses, showing disregard for the rule of law and dictatorial instincts in their actions. This week’s election will be a referendum on his performance regarding the fight against corruption, fixing the economy and tackling insecurity, regardless of what his administration touts as their achievements. 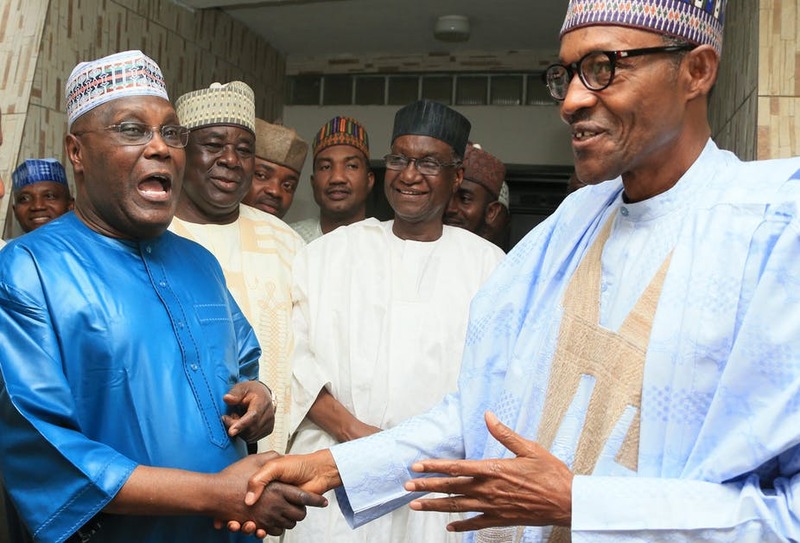 Buhari’s main challenger, Atiku Abubakar of People’s Democratic Party (PDP), has been dogged by persisting allegations of corruption dating from his time as vice president under former president Obasanjo between 1999 and 2007. He denies any wrongdoing and has neither been charged in Nigeria nor the United States where his name cropped up in graft probes. He is wealthy businessman with investments in oil and gas, shipping, real estate and schools. He has promised business-friendly policies and a commitment to double the economy to $900 billion by 2025 if elected. His critics say he would exploit those pro-business policies to enrich himself and his friends. Religion and ethnicity exert major influence on Nigeria’s politics. With the country deeply divided between the mainly Muslim North and the largely Christian south, there are more than 200 ethnic groups in Nigeria. The Hausa/Fulani in the north, the Yoruba in the southwest and the Igbo in the southeast are the dominant ethnic groups. This religious and ethnic mix has been a major fault line in Nigeria’s politics. As a way to deal with this, the main political parties have evolved an informal formula for power-sharing with the presidency alternating between the north and south after every constitutionally mandated limit of two four-year terms. President Muhammadu Buhari, a Muslim from the North is in his first term, having been elected in 2015. For the opposition PDP, they held power under President Goodluck Jonathan, a Christian from the south who was Buhari’s predecessor. In keeping with the informal formula of power rotation, the PDP selected Atiku Abubakar, a northerner, to be their presidential candidate for 2019 as it is not the turn of a southerner. With both Buhari and Atiku being northern Muslims of the Fulani ethnic stock – the prospect of election violence around ethnicity, religion and region is minimized. The implication of this balance of forces between the two leading candidates is that the outcome of the election will be most likely determined by regions outside of the main power blocks of Nigerian politics. Results from the past elections show the north as Buhari’s stronghold. With an influential main challenger from the same region, and of the same ethnicity, his dominance will be challenged. PDP on its part had proven a strong force in the South. Recent developments in the central Nigeria, the so-called Middle Belt, is likely going to have implications for the outcome of the presidential election. Persistent eruption of violence between farmers and nomadic herders which according to non-governmental sources put the death toll at over 3,500 in the last three years, will probably play into the dynamics of determining which way the region votes. The main drivers of quest for power in Nigeria’s politics have largely revolved around the control of Nigeria’s oil revenues, patronage and complex rivalries between ethnic groups more than any ideological views on the economic and social policies or directions of the nation. In this regard, the two leading political parties, the ruling APC and the opposition PDP, seem to be different sides of a coin. Buhari’s 2019 campaign message has focused on poverty alleviation and infrastructure improvement while Atiku’s is on the need for a better business environment as well as infrastructure. With days to the presidential election, there’s a mounting fear of meddling in the process and possible rigging among observers and civil society groups. Their concerns and call for free and fair elections stem from the conduct of state level elections last year. Power transition has always been problematic in Nigerian politics. However, the 2015 election seemed to be a watershed with a peaceful handover of power from a defeated incumbent. Even at that, independent observers reported evidence of widespread electoral process corruption like vote buying and voter intimidation. The recent suspension of the chief justice by president Buhari has raised fears of a constitutional crisis and suspicions about the motives for the suspension given that the chief justice will have a critical role in resolving disputes on electoral results. President Buhari claimed to have anchored his decision on a court order which appears not to be in line with constitutional provisions. Britain, United States and the European Union have all expressed concern about the move, a development that the Nigerian government viewed as foreign interference and a challenge to the nation’s sovereignty. With latest release of the voter register, 84 million Nigerians have registered to vote with Lagos and Kano states leading with 6.5 million and 5.4 million respectively. Regionally, North West has 20 million registered voters which is 24% of total registered voters followed by South West with 16 million registered voters which is 19.39% of the total registered voters. Other regions include: South-South with 12 million, South East- 10 million, North-East- 11 million and North-Central- 13million registered voters. To be declared winner under Nigeria’s electoral laws, a candidate must get the highest number of votes cast and at least 25% of votes in two-thirds of the country’s 36 states and the Federal Capital Territory. So, the question is, will there be any surprises from the field of the youthful 70 other presidential candidates? Or, are Nigerians truly facing a miserable choice between two septuagenarians?